This was the first time since our arrival in June that we saw this many sunbathers at a beach in Australia. The sun is very strong here resulting in the use of rental umbrellas and shade as needed. While living in Hawaii for eight months we frequently heard about shark attacks at a variety of nearby beaches. While living in Australia, we continue to watch news stories of more and more shark attacks in Australia and throughout the world. Here is an amazing video of a shark attack that occurred a week ago to a renowned Australian surfer, Mick Fanning, during a surfing competition in South Africa that occurred one week ago with hundreds of shocked onlookers. Watch how he remarkable gets free of the shark. 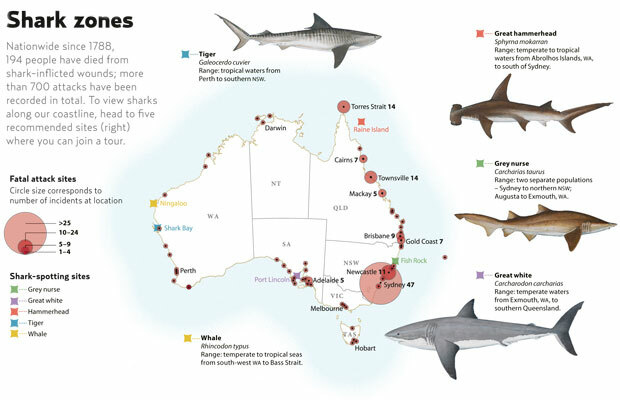 "According to the Australian Shark Attack File, kept by researchers at Sydney's Taronga Conservation Society, there have been 999 shark attacks in Australia since records began in 1791, and 232 of them have been fatal. All up, about one-quarter of shark attacks are fatal, and the average fatal attack is one person/year. Large sharks, such as these five species, range far and wide and visit multiple levels of the water column. (Credit: Australian Geographic). 25 July, 2015: Tasmanian man Damian Johnson, 46, is killed by a great white shark while diving for scallops with his daughter, between Maria and Lachland islands. 9 February, 2015: Japanese national Tadashi Nakahara, 41, is killed at Shelly Beach, at Ballina, in northern NSW. A local surf shop employee, he was believed to be taken by a great white shark while he was out surfing. 29 December, 2014: Jay Muscat, is killed at Chaeynes Beach, east of Albany in Western Australia. 15 December, 2014: Daniel Smith, 18, of Mossman, is killed while fishing at Rudder Reef, off the coast of Port Douglas. 9 September, 2014: Paul Wilcox, 50, is found floating and is unable to be resuscitated after being pulled from the water near Clarkes Beach at Byron Bay. Wiitnesses saw a 3m great white in the area immediately after the attack. 3 April, 2014: Christine Armstrong, 63 is taken by a suspected bronze whaler shark as she lagged behind her daily swimming group at Tathra Beach, NSW. 8 February, 2014: High school English teacher and experienced diver Sam Kellet, 28, is killed by a suspected great white shark while he was spear fishing near Edithburgh, SA. 29 November, 2013: Zac Young, 19, dies from cardiac arrest after being attacked by a shark while bodyboarding with friends near Riecks Point north of Coffs Harbour in NSW. 23 November 2013: Chris Boyd, 35, is attacked by a shark, believed to be a great white, while surfing at the popular surf break Umbries off Gracetown in WA. 14 July 2012: Ben Linden, 24, is killed while surfing near Wedge Island, Western Australia, 180km north of Perth. A witness who tried to help said the shark swam away with the body. 31 March 2012: Peter Kurmann, 33, is taken in south-western WA while diving in the Port Geographe Marina. His brother, who was diving with him, tried to fight off the shark with a knife. 22 October, 2011: American tourist George Thomas Wainwright, 32, sustains horrific injuries and dies while scuba diving off Rottnest Island. 10 October, 2011: Bryn Martin, 64, disappears at Cottesloe Beach and is presumed a shark attack victim. Only his damaged Speedos were found. 4 September, 2011: Kyle Burden, 21, is taken by a shark while bodyboarding with friends at Bunker Bay, near Dunsborough, in Western Australia. 17 February 2011: An abalone diver is taken in an attack by two sharks, believed to be great whites, while surfacing near Perforated Island in Coffin Bay, South Australia. 17 August 2010: A 31-year-old man dies from serious injuries after being attacked by a shark while surfing near Gracetown in Western Australia's south-west. 27 December 2008: Fisherman Brian Guest, 51, is taken by a great white while snorkelling at Port Kennedy in Perth's south. His son and beachgoers saw the shark attack and swim off with him in its mouth. 8 April 2008: A 16-year-old boy from Wollongbar is killed by a shark while bodyboarding off Ballina's Lighthouse Beach on the NSW north coast. 7 January 2006: Sarah Kate Whiley, 21, is mauled by up to three bull sharks while swimming in waist-deep water with friends at Amity Point, off south-east Queensland's North Stradbroke Island. 24 August 2005: Marine biologist Jarrod Stehbens, 23, is taken by a shark, believed to be a great white, while diving for cuttlefish eggs with colleagues off Adelaide's Glenelg Beach. 19 March 2005: Geoffrey Brazier, 26, is attacked by a 6m-long shark, believed to be a great white, while snorkelling near the Abrolhos Islands, off Geraldton, 500km north of Perth. 16 December 2004: Nick Peterson, 18, is killed instantly when attacked by a great white shark while he was being towed behind a boat on a surfboard 300m off Adelaide's popular metropolitan West Beach. 11 December 2004: Mark Thompson, 38, is attacked by a shark while spear fishing with two friends at Opal Reef, about 75km from Cairns in North Queensland. He died from a cardiac arrest soon after the attack. 10 July 2004: Brad Smith, 29, is attacked by two sharks, believed to be a great white and a large bronze whaler, while surfing near Gracetown in Western Australia's south-west. 8 February 2003: Bob Purcell, 84, is attacked by a 2.5m bull whaler while swimming in Burleigh Lake on the Gold Coast in Queensland. 16 December 2002: Beau Martin, 23, is attacked while swimming in Miami Lake on the Gold Coast in Queensland. 30 April 2002: Scallop diver Paul Buckland, 23, is dragged from a mate's arms by a 6m-long great white while trying to get on board a boat in Smoky Bay in the Great Australian Bight, South Australia. We are located near Cairns, marked at #7 on this map. Sure, if we posted a list of all of the fatal auto accidents in these beach areas, it would far exceed the loss of life from shark attacks. However, the fear associated with shark attacks far exceeds the fear of being in an auto accident. As posted at all beaches, there are waning sign regarding stingers which are prevalent in these waters throughout Australia. Although its winter in Australia now, the temperature is a comfortable average of 80F, 27C with sun shining at least part of most days. One would expect this type of weather to attract sunbathers and swimmers to the beaches. Tom walking toward the famous Four Mile Beach in Port Douglas. (More photos of this expanse of beach will be posted tomorrow). As we continue to visit the local beaches, walking along the shore, we seldom encounter sunbathers and swimmers except as shown in today's photos from our recent visit to Port Douglas. In this particular location, a resort area, there were multiple lifeguard stations and emergency equipment on hand. Even in this scenario there were few swimmers in the water. More signs warning of stingers. We've seen no warning sign regarding sharks. Although, when there's an attack, the beach will be closed for a few hours or a day. Helicopters scan the waters where the attack occurred to determine what type of shark is nearby and if its safe to reopen the beach. Most often, they spot the Great White. Sharks. We realized that the stingers and possible crocodiles may be a huge deterrent to swimmers. Adding the recent news about a shark attacks including this attack reported yesterday, its no wonder the beaches are generally barren. Luckily, this surfer will also survived the attack after serious injury. This was a first for us, seeing a sign such as this for treatment of stinger attacks. As much as we've been encouraged to snorkel and scuba dive, neither of us have a propensity to swim in the ocean. Believe me, we've literally been nagged by friends and family to take up snorkeling. We are land people. And, although we enjoy sitting by a pool and dunking on occasion to cool off, we hardly swim, although we're both good swimmers. When we began our travels we spent the first two and a half months outside the US in Belize in Central America living with the ocean outside our door, perhaps 25 feet from our veranda. Each day, we walked along the beach although we'd been warned about stingrays in shallow water. A tourist staying in the same resort was seriously stung by a stingray while standing in shallow water. It was a four hour drive on an awful road for medical care. This was the first beach we'd seen that offered chair and umbrella rental. Our injuries occurred when the steps at our condo collapsed under our feet and we were injured on the night of our anniversary. Tom's injuries were less serious, mainly small cuts and scrapes. (Click here for the post regarding our fall). I refused medical care. It took a month to recover from a back and neck injury. This particular injury was unavoidable. There was no evidence that the steps were ready to collapse. As shown in these photo, few swimmers are in the water, many fearing sharks and stinger. It was after the injuries from the fall and the woman being stung by a stingray that we decided to consider our safety above all else in our travels. It was this diligence that later kept us safe spending nine months in Africa where one can easily be injured on an unlit walkway exiting a restaurant at night, a lack of a handrail on a steep stairway or...much worse. Some sunbathers are less cautious of the sun. Of course, we've taken considerable risks in many of our adventures but those too were made with education and safety measures in mind. If we were to sustain a serious injury we have no home in which to live to recover, as most people do. As shown in our many posts, we've experienced so much. But, entering the ocean, other than in a boat isn't something we choose to do. This is the resort located across the road from the area we visited. An oceanfront property is always our first preference in a vacation home, not for swimming but for the view, the smell of the sea and the sound of the waves. What is more beautiful than the view of the sea? The ocean must be respected for its vastness, its mystery and its possible risks. Although the likelihood of being attacked by a shark is very slim, we have no doubt that surfers worldwide are always on the lookout for that fin or the feel of "something" brushing against their skin. No thanks. One year ago today, we posted our last post for Madeira, Portugal as we made our way to Paris for two weeks staying in a hotel and then on to London for two more weeks in a hotel. Who travels the world without visiting Paris and London? Please click here to that final post which also offers a link to my first blog post long before we ever decided to travel the world. Dentist and kangaroos...Another g'day in Australia! The dental office is easy to find. Its outside the main entrance to Smithfield Mall on the nearest to Woolworth's Grocery store. Visiting a dentist has always been a dreaded experience for me. As many of you, from time to time I had less than ideal experiences leaving an indelible mark on my psyche. These experiences left me with a degree of dental phobia and/or dental anxiety which is more common than we can imagine. As a matter of fact there is such a thing as the "Dental Anxiety Network" specifically for dentists to ensure they are well educated in dealing with anxious patients. I'll admit to becoming anxious when I have to have anything other than a cleaning which causes little apprehension. Its the fillings, crowns and surgeries that incite a sense of fear. Some reports state that as many of 80% of patients have some degree of dental phobia. The professional, clean and organized dental office, 1300 Smiles at Smithfield Mall made us both feel at ease. As a result I didn't feel apprehensive when our intent for yesterday's two appointments was singular: clean our teeth, no x-rays. With neither of us experiencing any pain or apparent difficulty with our teeth, we hoped for good results. Both of our appointments transpired at exactly the same time, 1:00 pm on Thursday, with a plan to shop when done. The dental clinic, 1300 Smiles, is located in the Smithfield Mall around the corner from the meat market, the produce mart, the pharmacy and the grocery store, definitely a convenient location for the four additional stops I needed to make when we were done at the dentist. Much to my surprise the dentist, Dr. Neil McElvanna, did my cleaning as opposed to a dental hygienist which is the usual procedure in the US. Most hygienists in the US (our only experience until now) provide excellent service often after many years of experience. The treatment rooms were spotless and were equipped with the most up-to-date equipment from what we could determine. After my painless procedure was completed with positive comments as to the condition of my teeth and gums after almost three years without a professional cleaning (we don't recommend waiting this long), Dr. Neil and I had a chance to talk. After inquiring as to our life of travel, we discussed the recent pointless slaughter of Cecil, the lion. Dr. Neil, with tongue in cheek, commented, "Too bad he's a dentist." I then commented, "Too bad he was from Minnesota from whence we came." Immediately, we had something, however sad, in common. We proceeded to discuss my way of eating which may have a beneficial effect on dental health which he said was evident in my lack of periodontal disease. Sure, I had a degree of plaque which he readily removed that no matter how often I cleaned my teeth, I couldn't entirely eradicate. But, I had no inflamed or swollen gums or areas of concern. In the old life, both of us had to visit a periodontist on a few occasions. That was while we were still consuming vast amounts of sugar in various forms. However, our good results aren't entirely a result of not having sugar floating around our mouths. It's also a result of the systemic production of stomach acids, good gut bacteria and general good health from consuming a healthy low carb, grain, starch and sugar free ketogenic diet for the past almost four years. ﻿Now, with a clean dental bill of health and the fact that we may not see another dentist until we arrive the US in 2017 we can rest easy that both our medical and dental exams provided us with peace of mind only adding to our enthusiasm as we continue on in our travels. This adult kept watch while the others rested. With only crocs as potential predators and the kangaroos keeping a distance from the ocean and rivers, the kangaroo population continues to grow in Australia. Here are the estimated stats for the kangaroo population. There are an estimated over 20 million kangaroos in Queensland according to these 2011 stats. The shocker? The cost for both of us was a mere AUD $196, USD $142.89, which is only AUD $98, USD $71.45 each. We had refused x-rays which of course lowered the price. Had either of us been experiencing any pain or discomfort, we'd have opted for the x-rays. Why be exposed to radiation when there's no need? This young kangaroo looked sleepy and ready for a nap. 1. Using Brush Picks by The Doctors after eating. We keep these picks with us at all times. We recently purchased several packs of these at the Alive Pharmacy at Smithfield Mall. 2. Oil Pulling each day using unrefined, cold pressed, organic coconut oil, swishing for 20 minutes. 3. We brush our teeth twice a day using non-fluoridated whitening toothpaste (brands vary throughout the world. We don't use fluoride when we can avoid it). 4. We brush with the above toothpaste adding baking soda and hydrogen peroxide onto the brush. These items are available worldwide. 5. We used pulsing toothbrushes. (We'd purchased a good sized supply on past visits to Costco but, these can be purchased at pharmacies and grocery stores throughout the world. Kangaroo family lounging under the shade of a tree and a bench. We stress that if there is evidence of periodontal disease, the above measures would be effective only after a course of professional treatment had been exercised. We don't recommend seeing a dentist only once every three years. In our old lives, we had our teeth cleaned every six months. The thorough cleaning, the pleasant and professional dental office and the expert care of the dentist, Dr. Neil and his staff, left us with a "great taste in our mouths!" With our medical appointments behind us with good results we have a renewed sense of freedom. Thanks to our readers for their encouragement and support in assisting us in making the decision to get these medical exams behind us. Our efforts for ongoing health continue with exercise, healthy diet, dental care and a positive state of mind which, armed with this good news, is certainly enhanced. Kangaroos are shy unless they've been in an area where they frequently interact with humans. These are wild kangaroos resulting in photos taken from afar. Tomorrow, we'll continue with more photos from our trip to Port Douglas as we plan our next road trip. Hummm...wonder where that will take us? Happy end of week to all! We didn't post on this travel date. Back tomorrow with August 1, 2014! Part 2...Road trip...Port Douglas...Lots to share after a perfect day...Photos shown in progression...Cecil, the slaughtered lion...One of our lion photos..
A number of visitors were lounging in this beach park in Port Douglas. The main street, Macrossan Street, in Port Douglas consisted of one store, shop and restaurant after another. Whether we wandered the quaint streets or walked the Four Mile Beach we always felt safe and comfortable. The only fear was going into the water where stingers lurked in abundance awaiting their next brush against human skin to leave their indelible mark. Taking photos was easy on the sunny day. We surmised that the possibility of being stung by one of many of a variety of stingers keeps swimmers out of the water at all of the pristine beaches we've visited over these many weeks. More shopping continued on Wharf Street. We noticed that there are no vendors lining the beaches in Queensland scrambling in an attempt to sell their wares. Either there are laws regarding this or, we are in an area of less poverty than many other areas of the world we've visited in the past. There are almost 100 restaurants in Port Douglas. Its become familiar to us to being approached by locals trying to encourage us to purchase their handmade crafts and local trinkets. With no room in our luggage and no home to eventually use or store such products, buying anything doesn't fit into the realm of our lives. Many of the restaurants are huge and elaborate attracting the most finicky of diners. Without question, we certainly appreciate the diligence and hard work of those vendors throughout the world. But, for us, practicality must prevail. As we wandered on foot a beach area, we spotted the historic Court House and museum. Unfortunately, it was closed or we'd have loved to go inside. As we wandered the main streets in Port Douglas, we realized that no matter how much "sightseeing" we do, we don't fit into the typical tourist category. Walking past the shops we chuckled over how unlikely it is that we'd purchase any of the clothing, bags, shoes and household goods. Tom was admiring the trees at the beach park. And, the many charming beachfront restaurants didn't appeal to our senses either when we've resigned ourselves to the fact that dining in restaurants in Australia may not be possible for me. An unusual tree with a portion of its root system above ground. Checking out every posted menu as we walked, we further confirmed this fact. Most of the meats offered on the menus are coated in sauces and battered in a manner that doesn't work for me. The side dishes are starchy and often tinged with sugar. Its winter in Australia and we don't see as many of flowers as there are in the spring. The thought of spending US $22, AUD $30 for a unseasoned slab of barramundi and a plain lettuce salad doesn't appeal to me when we can go to our favorite fish market and purchase barramundi for under US $5, AUD $9 a serving, seasoned by us to perfection, with a side of sautéed veggies, a salad with homemade dressing and a coconut flour muffin slathered with grass fed butter. We wandered about this beautiful beach park. When dining in restaurants we have the concern of the food having been cooked in the same pan as those items I cannot have. The risk of contamination is high. Nor do we expect restaurant cooks and chefs to make special accommodations for me with the use of their cookware. The views from every direction were breathtaking. Sure, we'd love to visit a fabulous beach area and sit down for meal. But, we always remember that we wouldn't be traveling the world if it weren't for my strict low carb, grain free, starch free, sugar free and chemical free way of eating that brought me to exquisite good health after years of suffering. A buoy to mark low water. If Tom would like to dine out, I'm happy to join him and order that plain steak or fish and plain salad with nary a complaint. Surprisingly, after all of this time Tom doesn't feel shortchanged. Perhaps, that is why he loves cruising. The tide was low giving us an entirely different perspective of the beach. While on a cruise, Tom can order anything he wants without concern or worry when the ship's chefs manage to make everything work for me as they do for many other passengers with special diets. There are many beaches that are covered with rock but, overall the beaches we've seen are sandy. Without shopping, without dining out, without spending on pricey tourist attractions we happily find an entire world of wonder that we easily appreciate and cherish for its natural and unique beauty. This enormous Banyan Tree reminded us of the tree across the street from our condo in Honolulu. In our old lives of seldom traveling we'd often spend considerable time at the hotel, the pool, the hotel's beach, a wide array of local restaurants and visiting a few choice attractions popular in the area. This gave us a limited perspective of the area. Possibly, a memorial for a beloved individual lost to the sea in this location. Now, we live in an area shopping in their shops, cooking their locally grown foods, meeting the locals, wandering through their farmer's markets and most of all visiting those special places that Mother Nature created for us to respect and...for us to appreciate with love and care. For this, we are grateful and for this, Port Douglas never let us down. From this view, we were seated in white chairs facing the ocean, left from a recent wedding. It was a perfect spot for a wedding. It was these rose petals on the ground that made us realize that a recent edding had been held in this spot. You, Cecil, are the reason I am a proud African. Your spirit, your grace and your courage epitomise my Africa. You are the reason my team and I do what we do. I am so sorry that you had to endure 40 painful hours with an arrow lodged in your body, that you were then shot, beheaded and skinned – turned into a trophy for a man whose only understanding of Africa is that our laws cannot protect you from his money. I am sorry that more was not done to protect you and I am outraged that you and your kind are seen not as kings, but as commodities. On a selfish level I am sorry because I will never see you with my own eyes. RIP big guy, and know that many of us humans DO care, and we are trying, desperately, to fight for you and yours. Last known photo of Cecil (lying down) and Jericho who both protected their 25 cubs. Now, with Cecil gone, Jericho may not be able to protect those cubs on his own, resulting in their death. (We borrowed this photo from the UK Telegraph). We took this photo as one of many lion photos that we had the gift of seeing in the Masai Mara in October, 2013 while on a photo safari. This experience forever changed our hearts and minds with love and appreciation of these magnificent beings. For more photos and details of our safari which we spread over many posts, please begin by clicking here and continuing on from there. Our last night in Madeira, Portugal as we'd begin the trip to Paris in the morning. It was a memorable two and a half months but, as always, we were ready to continue on. For that final post with some of our favorite photos, please click here. Every beach along the way has it own personality. They may all look like sand, rock and water but we find each one to have it own unique scenery. Since arriving in Trinity Beach on June 11th, its been in our minds after many recommendations from Aussies we met on the most recent cruise that a visit to Port Douglas was definitely worthwhile. We had traveled part of the way toward Port Douglas several weeks ago, posting photos. Thus, we began taking photos after that point to avoid repeats. We couldn't agree more. After uploading yesterday's post I was particularly interested in heading out on this must-do outing. On a whim, I suggested to Tom that we make the trip at long last. Some beaches have massive expanses of sand and other have less sand and more rocky shorelines. In minutes, we were heading out the door with a container of iced tea, our mugs, extra camera batteries which we always keep charged, binoculars, the hot spot and unlocked phone ready to use for navigation if we needed it in a pinch which we never did. Up until yesterday we'd only seen a few people on the beach such as in this photo. However in days to come, we'll be sharing surprising photos of a packed beach. We always take along our small insulated bag just in case we stop for perishable items we may find along the way. Although we didn't purchase a thing other than fuel, we came home to leftovers and time for a quick few hands of GIN before dinner. We saw Double Island in the background. It was a perfect day, returning with almost 200 photos most of which I've already perused, deleting those we didn't need to keep. Its always challenging determining which photos we'll chose to post. As usual we'll decide as we post over the next several days. This beach was covered with rock and wild vegetation. The coastline drive from Trinity Beach to Port Douglas consists of many areas of very steep winding mountain roads. If rushing, one could make the trip in a period of shortly over an hour moving as fast as the posted kilometer signs or, as we did over a considerably longer period by often stopping to admire the scenery and take endless photos. We had to travel quite a distance to no longer see Double Island which we can see from our veranda with Scout Island to the far right. We were in no rush. Our goal was to see as much as we could and return on the steep winding highway before dark. When we returned home before dark we were pleased for a great day out and also for one more desirable experience in visiting this area of Queensland. The sand is so fine on the beaches that after taking a few photos, I have to gently wipe the miniature grains off of the lens. The drive along the Coral Sea was beautiful on a mostly sunny day. As typical in this ocean climate, the sun was in and out all day long. We've yet to experience a day that remains sunny without an intermittent cloud cover throughout the day. Today's and future day's photos will be posted in the order we took them. "Port Douglas is a town in Far North Queensland, Australia, approximately 70 km (40 mi) north of Cairns. Its permanent population was 3,205 at the time of the 2011 census. The town's population can often double, however, with the influx of tourists during the peak tourism season May–September. The town is named in honour of former Premier of Queensland, John Douglas. Port Douglas developed quickly based on the mining industry. Other parts of the area were established with timber cutting occurring in the area surrounding the Daintree River and with settlement starting to occur on lots around the Mossman River by 1880. The Port Douglas township was established in 1877 after the discovery of gold at Hodgkinson River by James Venture Mulligan. Port Douglas Post Office opened on 1 September 1877. It grew quickly, and at its peak Port Douglas had a population of 12,000 and 27 hotels. With the construction of the Mulligan Highway it serviced towns as far away as Herberton. On 4 September 2006, entertainer a.k.a. "Crocodile Hunter" Steve Irwin died at Batt Reef, off Port Douglas, after a stingray barb went through his chest into his heart while Irwin and his crew were filming a documentary called The Ocean's Deadliest. Irwin was filmed snorkeling directly above the stingray when it lashed him with its tail, embedding its toxic barb. Irwin died almost immediately. This event was widely reported both in Australia and overseas. In 2012, Port Douglas was the pole position for a Total Solar Eclipse. This phenomenon took place at 6:38 am on 14 November 2012. The total eclipse was visible from approximately Innisfail in the south to Cedar Bay National Park in the North. Port Douglas was right in its path. Thousands travelled to Port Douglas to see the event." Many beaches offer shady spots for those preferring to be out of the sun. And yet, we seldom see people of the beaches as in this case of this pristine Ellis Beach. Unquestionably, Port Douglas is an ideal tourist town. We drove past numerous fabulous resort, hotels including some which were quaint and tucked away in the forest while others were lined up along the main roads for quick and easy access to restaurants, shops and attractions. We were looking forward to seeing the renowned Four Mile Beach, a major attraction in Port Douglas. The downtown area which we'll share in photos over the next several days was lined with shops, dining establishments, tourist planning centers and travel agencies many of which were on Macrossan Street and Wharf Street. A shopping enthusiast could easily spend days wandering up and down the main street in downtown Port Douglas. When we spotted the sign for this resort, we decided to drive in off of the highway to see it. The waterfront, pier and marina were stops we thoroughly enjoyed stopping and easily parking to get out and explore. Most likely, we parked no less than a dozen times to get out of the car to check out the scenery. We saw as much in one day as many tourists may have seen over a period of days. We decided against visiting any of the fee based tourist attractions. The crowds, the queues, the waiting, and the cost kept our interests focused on perusing the naturally beautiful scenery that Port Douglas has to offer which as you'll see are many. We couldn't resist this view as we entered the grounds of Thula Nature Reserve to check it out. Back on the highway, we were close to entering the Port Douglas area. We have a few more road trips in mind over our remaining time in Trinity Beach. Currently on day 48 of 88 days, we're beyond halfway of our time in this area. With many booked upcoming cruises sailing the perimeter of the continent, we'll have plenty of additional opportunities to visit many of the highlights of Australia we'll surely have missed along the way. Through the car's windshield, we spotted one of the first resorts in Port Douglas. We had arrived! We'll be back tomorrow with lots more. Please stop back tomorrow for more photos from our road trip to Port Douglas, its wonderful town and more. We'd made an error in posting the correct one-year-ago-date a few days ago. Please click here for the correct post from one years ago today as we wrapped up our time in Madeira. Part 2, the gap is filled! Part 1, the gap is filled!